Thai Smile is a good name for this restaurant because I smile every time I go here. The people are friendly, the food is delicious, fresh and very reasonably priced. 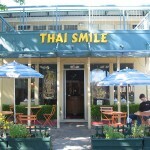 I went to Thai Smile in San Rafael for lunch today. I started with a Thai Iced Tea. If you have never tried Thai Iced Tea before I highly suggest adding this to your “things to try in life” list. I LOVE Thai Iced Tea. We had yellow curry with chicken and veggies, stir fried eggplant with tofu and vegetarian Tom Ka soup make with coconut milk and lemon grass. I absolutely love Tom Ka soup and this one was delicious and hit the spot on this cold Bay Area day (about 40 degrees – brrrr). On this very cold day in the Bay, Thai Smile was warm and cozy inside. It was a pleasure to be able to warm up while enjoying a tasty meal. I am a regular at Thai Smile…love that place! My kids love to sit in the upper area next to the fish tank. The owners are so nice, especially to children. I also go there with my good friend @momntwins for lunch quite a bit! Thanks Peggy. I think the regular TweetUp ladies should meet up here for lunch one of these days. What do you think? Yes, let’s do it. Regular TweetUp ladies, are you listening? TweetLunch at Thai Smile…probably after Xmas. I went to thai smile for the first time a few weeks ago and lovelovelove it! I’m in for a tweetlunch with the ladies!